When obsessive book-lover (ahem, book snob) Amruta – Ruta – Adarkar arrives in Delhi to work as a marketing executive for Parker-Hailey’s Publishing, she learns that the world of books is not as cozy as she’d imagined. Her eccentric taskmaster of a boss expects marketing miracles to happen on shoestring budgets and in record time, and surviving the job (and the city) means she’ll have to master the local art of jugaad really fast. 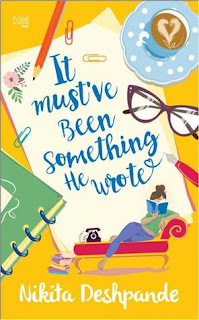 Worst of all, she’s stuck being a publicist for Jishnu Guha, protein-shake lover, serial selfie-taker, and bestselling author of seven cheesy romance novels, the kind she wouldn’t be caught dead reading. Nikita Deshpande is a creative nomad. A writer of copy, screenplay and poetry, she graduated in English Literature from St. Xavier’s College, Mumbai. 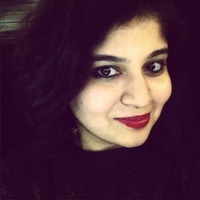 An occasional film-maker, she has assisted directors on prominent films such as Fukrey (2013) and Mirzya (2016), and was the writer/director of the winning commercial at Crash the Pepsi IPL (2015). It Must’ve Been Something He Wrote is her first novel.